First, let’s begin by stating the obvious – compared to the rest of the world, the broader Arctic region still has almost no infrastructure and what little exists is expensive. Canada’s per-capita transport and communications costs, for example, are 36% higher in the Northwest Territories and 160% higher in Nunavut than in the country as a whole. These costs, driven as they are by the still-extreme climate and extended transport routes, will continue to turn near- and mid-term expectations of large-scale wealth and development into fool’s gold. Second, there is the problem of maritime safety. Detailed and accurate sources of information on available sea routes, weather conditions, the location of icebergs and the thickness and movement of sea ice is mostly unavailable at present. Indeed, creating the transportation and meteorological datasets and information networks that are fundamental to this part of the world will take time and multinational cooperation if it is to be truly effective. Third, there is the problem of marine communications systems. At present, they too are limited in scope and technologically outdated. Analog radio broadcasting, for example, remains the primary method of communication in the Arctic, and it only exists in traditionally navigable areas. As in the two previous examples, this type of infrastructure will have to be created, updated and/or extended if Arctic development is going to occur anytime soon. Fourth, there is the problem of search, rescue and disaster response capabilities, which the five signatories of the Ilulissat Declaration (the Arctic littoral states of Canada, Denmark, Norway, Russia and the United States) acknowledged were inadequate as early as May 2008. But note that we are not thinking of a narrow problem here. Improving and expanding search, rescue and disaster capabilities in the Arctic actually means increasing the number of available deep-water ports, places of refuge and port reception facilities in the region. These havens will all be needed to provide waste management, emergency ship repair, and pollution countermeasure capabilities, to name just a few. Finally, and perhaps more critically, the Arctic region lacks effective emergency response mechanisms. Many of the same crises that now occur in other locales and waters, such as oil spills and shipwrecks, will also occur in the High North. 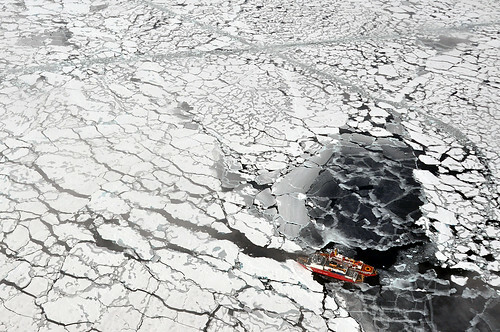 The problems there, however, will be more serious – not only because of the extreme conditions, but also because of lesser known impediments such as the International Maritime Organization’s (IMO) guidelines, which insist that navigation in Arctic waters should be restricted to skilled and well-trained seafarers. This concern with safety may be laudable, but absent a revision to the guidelines, the number of personnel available to respond to incidents in the region will be limited – i.e., too limited. The above problems are severe enough to sabotage the increasingly spurious claims that the High North will be the next ‘big thing’ in the global economy. And yet, to not start focusing on the Arctic’s infrastructure problems soon will only compound their eventual economic, social and environmental costs – in the form of maritime insurance rates, blighted native communities and more. What to do, then? Well, there already exists widespread agreement that future improvements to the Arctic’s infrastructure should involve the region’s relevant stakeholders, including northern governments, indigenous communities, and natural resources and shipping companies. What’s been missing, however, is a more comprehensive approach – i.e., the Arctic littoral states need to include outside actors in their deliberations. Thankfully, it appears they are starting to get the message. Although local states have traditionally been uneasy about opening up regional development discussions to the rest of the world, last year they granted six non-Arctic states, including Singapore and Japan, observer status to the Arctic Council. That’s a positive step in the right direction and should be pursued further. Singapore, for example, has expertise in port control while Japan has considerable experience with disaster management and preparedness. By actively engaging with these new players on infrastructure development issues, the region’s states can share the burdens and better manage the consequences of opening up the High North. Aiko Shimizu is an international relations professional focused on international security and energy policy. She is a Sasakawa Peace Foundation Fellow at the Pacific Forum CSIS. This blog, which has its roots in the WSD-Handa Global Opinion Leaders Summit held in Tokyo on September 6th, 2013, is part of an on-going partnership between the Pacific Forum CSIS and the International Relations and Security Network (ISN). Excellent article, though one group missing from the suggested infrastructure team at end are the climate scientists you mentioned at the beginning. Whatever infrastructure is built should be scaled to the20% of carbon reserves that is burnable without overshooting 2 C.
• We examine volumes of oil that cannot be used up to 2035 in a low CO2 energy system. • 500–600 billion barrels of current 2P reserves remain unused. • At least 40–55% of yet to be found deepwater resources must not be developed. • Arctic oil and most light tight oil resources remain undeveloped. • Unconventional oil production is generally incompatible with a low CO2 energy system. 80% of oilsands must stay in the ground if goal is to avoid 2 C global warming. http://www.die-gdi.de, or presentation on same at http://www.rcsd.org.cn/upload/news_528_20.pdf. – AR5 carbon budget, Chapter 10, p 67: The ratio of warming to cumulative emissions, the Transient Climate Response to Cumulative Emissions, is assessed to be likely between 0.8°C and 2.5ºC per 1000 PgC based on observational constraints. This implies that, for warming due to CO2 emissions alone to be likely less than 2°C at the time CO2 emissions cease, total cumulative emissions from all anthropogenic sources over the entire industrial era would need to be limited to about 1000 PgC, or one trillion tonnes of carbon (see Section 12.5.4). – Allen, M. R., D. J. Frame, C. Huntingford, C. D. Jones, J. A. Lowe, M. Meinshausen, and N. Meinshausen, 2009: Warming caused by cumulative carbon emissions towards the trillionth tonne. Nature, 458, 1163-1166.